LAMB has nine primary communities serving children ages three through six. 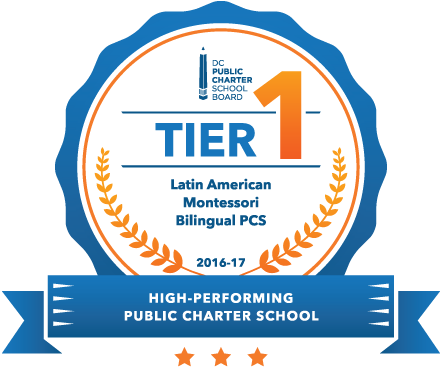 Each class is served by two Montessori-trained teachers, one Spanish dominant and one English dominant, as well as by Spanish dominant Montessori assistant teachers. The Missouri Avenue Primary classes are the Azteca, Cherokee, Maya, and Taino, named for native people of the Americas and Caribbean, and the Luna classroom. The four South Dakota Facility primary classes are Agua (water), Aire (air), Tierra (earth), and Sol (sun). In primary Montessori classrooms, students engage in a combination of individual, small, and large group work. Students demonstrate their love of learning by their interaction with the environment and need for activity and exploration. The 3-year-olds learn how to follow the Montessori work cycle, become adjusted to the school day, and develop basic skills that lay the foundation for more advanced work. The older children move through the environment exploring complex math, language, science, and geography work stations. All of the materials in the Montessori classroom are interconnected and follow a progression from simple to complex. LAMB primary students develop bilingualism through vocabulary objects and cards, songs, call and response, and repetition of words and phrases modeled by the instructors. The students also learn from each other, with younger children eager to imitate older classmates as they explore the environment practicing and mastering many skills. Students are fully immersed in a second (or third, depending on languages spoken in the home) language and advance from listening comprehension to speaking in words and phrases and then using full sentences in Spanish and English. A snack table with fruits, vegetables, and other healthy foods is available all day for children to eat when they feel hungry. Younger children nap after lunch, while older children continue working.The morning is Spanish immersion, and older primary students have an English language work cycle in the afternoons. The primary classes also participate in art and music classes weekly. LAMB’s primary classrooms are supported by trained special education inclusion teachers and work with students who have identified disabilities and an Individualized Education Plan (IEP).